Sky Hopinka is a Ho-Chunk Nation national and a descendent of the Pechanga Band of Luiseño Indians. 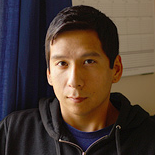 While looking for ways to learn Hočąk, one of his heritage languages, he met Evan at the Makah Canoe Journey in 2010, realized WAYK was a perfect fit, and in 2011 began learning chinuk wawa through WAYK, and took part in the Confederated Tribes of Warm Springs summer program WAYK was running that year. During his undergraduate at Portland State University he ran a chinuk wawa language night and helped train incoming WAYK interns. He was also able to graduate with chinuk wawa as his Bachelor of Arts foreign language requirement. Currently, he is attending the University of Wisconsin Milwaukee where he is pursuing an MFA in Film, Video, and New Genres. His video work focuses primarily on language and culture and in no small part has been informed by his experiences with WAYK and language teaching and learning. Being in Milwaukee has the added benefit of allowing him to focus on learning Hočąk and applying WAYK to that learning process. He’s always looking for TQ:Wingpeople, so anyone interested in learning Hočąk, let him know. Follow Sky on Twitter and Instagram.